Glycolic cleanser with benzoyl peroxide can help clear up acne. You may not be able to find a product that combines the two in one cleanser, but many people have had great results by following a glycolic wash with a benzoyl peroxide acne cream. The active ingredient in glycolic cleansers is glycolic acid. Glycolic acid is one of the alpha-hydroxy acids, often called AHAs. They're made from natural sugars found in fruits and milk. Manufacturers claim that AHAs, including glycolic acid, can work wonders for your skin. They're said to clear up wrinkles, treat acne, get rid of sun damage, and fade dark spots. In fact, they do appear to help with all these things. Although they may not work miracles, they can improve the appearance of your skin. Benzoyl peroxide has two primary actions to treat acne. It helps clear away dead skin cells, which can clog pores. 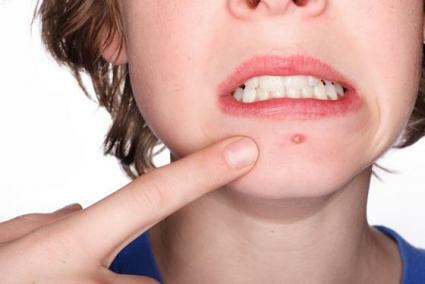 It also helps reduce the amount of Proprionibacterium acnes, the bacterium that causes pimples, on the skin. Benzoyl peroxide can bleach fabrics, so be careful not to splash glycolic cleanser with benzoyl peroxide on clothes or towels that you care about. If you're using a glycolic cleanser, you'll need to be extra careful about protecting your skin from the sun. Glycolic acid makes the skin more susceptible to sunburn and other sun damage. Use a high-SPF sunscreen and stay in the shade during the middle of the day. Some people are sensitive to glycolic acid. It can cause redness, swelling, blistering, and skin discoloration. It can also cause an itching or burning sensation. Strong concentrations of glycolic acid are more likely to have these effects. Look for products with AHA levels of 10% or less. Look for products with a pH of 3.5 or more; lower pH means stronger acids, which are harder on the skin. Benzoyl peroxide can also be irritating to skin. Adults seem to be more sensitive to it. This may be because benzoyl peroxide is drying, and older skin tends to be drier to begin with. Some people will also see redness or other irritation. If skin problems develop when you use a glycolic cleanser with benzoyl peroxide, stop using the products right away. If the rash doesn't clear up, see your doctor. It's hard to find a cleanser that contains both glycolic acid and benzoyl peroxide. Usually these two products are sold separately. You can find both glycolic acid washes and leave-on products. Combining a leave-on glycolic acid cream with benzoyl peroxide may be too harsh for sensitive skin. However, using a glycolic cleanser and then a benzoyl peroxide cream works well for many people. Glycolic acid and benzoyl peroxide are available at many different price points, from the cheap drugstore versions to fancier products you can only buy through a doctor's office. Clearasil. Clearasil is the old standby for millions of teenagers, and the medicine their parents remember using, too. The company now makes a wide range of acne-fighting products, many based on benzoyl peroxide. Although you won't find glycolic acid in Clearasil products, you will find a toner with salicylic acid, which has similar effects. Zapzyt. Zapzyt is another benzoyl peroxide cream. Pond's. Pond's makes glycolic acid cloths for cleansing the face. They're sold as Dramatic Results Age-Defying Cleansing Towelettes. Proactiv. Proactiv's regimen consists of three steps, a cleanser, a toner, and a lotion. The cleanser and lotion contain benzoyl peroxide. The toner's active ingredient is glycolic acid. M.D. Forte. These products claim to offer higher AHA concentrations without irritating skin. The manufacturer tries to limit their sale to doctors' offices or through the company web site, but you'll also find them at online stores like Drugstore.com.